20 Marines Face Possible Punishment Over Hazing At Parris Island : The Two-Way A Marine Corps report found a pattern of abuse at the South Carolina training facility, and linked it to the suicide of one recruit. The recruit's family says they don't believe his death was suicide. A Marine Corps drill instructor watches recruits on the parade deck during boot camp at Parris Island, S.C., in 2007. After a Marine Corps report found a pattern of abuse at the Parris Island training facility in South Carolina, 20 officers and enlisted leaders could face punishment, including potential criminal charges or court-martial. The investigative report linked the hazing activities at Parris Island to the March 18 death of one young recruit, Raheel Siddiqui. Military officials say Siddiqui killed himself, but this week Siddiqui's family released a statement through their lawyer challenging that idea. "It's impossible for his family and friends to accept that he took his own life," lawyer Shiraz Khan said, according to the Detroit Free Press. NPR's Tom Bowman joined All Things Considered on Wednesday to discuss the hazing uncovered in the report. "Some of it's juvenile," he said, "like forcing a recruit to eat four slices of bread and a bagel and a biscuit all at once without water." "He was a Pakistani immigrant from Detroit. He was called a terrorist by his drill instructor. Saddiqui talked about suicide while he was there and later recanted. "Then when Siddiqui said he was sick, the drill instructor forced him to run. Siddiqui fell, started crying. The drill instructor slapped him hard, and the recruit immediately ran and jumped off a third-story deck, killing himself. "In another case, a Muslim recruit was questioned about his religion, whether he was part of the 9/11 attacks. And he was placed in an industrial dryer by a drill instructor who turned it on repeatedly." Tom said the pattern of abuse was in one battalion at the training center. The report described the battalion commander, a lieutenant colonel, as "a toxic leader" who created an atmosphere of abuse. The pattern stretches back for years, Tom said, long before the death of Siddiqui, who was 20. There's no indication the abuse was widespread outside of the one battalion, he reported. 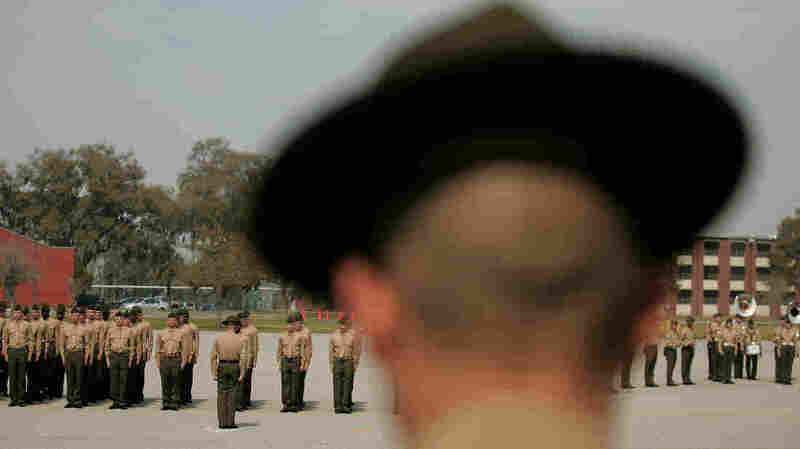 "The drill instructors are supposed to be very tough, of course, but the Marine drill instructor creed says they'll show by their own example the highest standards of personal conduct, morality and professional skill," Tom explained. "This is a classic case of abuse of authority." A total of 20 people are now facing possible punishment. The report also calls for greater oversight of training activities at Parris Island, according to The Associated Press. "Some of the 20 commanders and senior enlisted leaders have already been fired, including the three most senior Marines in charge of the recruit's unit. The Marines also ordered that the rest be temporarily relieved, according to a statement sent to The Associated Press. Discipline could range from administrative punishments, such as counseling, to the most severe action of military charges and courts-martial. "No formal charges have been filed. Under military law, a preliminary hearing must be held that will determine whether the incident warrants further administrative or judicial action in every individual's case. That process could take weeks to months, and the individuals would not be identified unless they are formally charged." A previous version of this post incorrectly referred to a lieutenant general who was described in a military report as "a toxic leader." It was a lieutenant colonel.